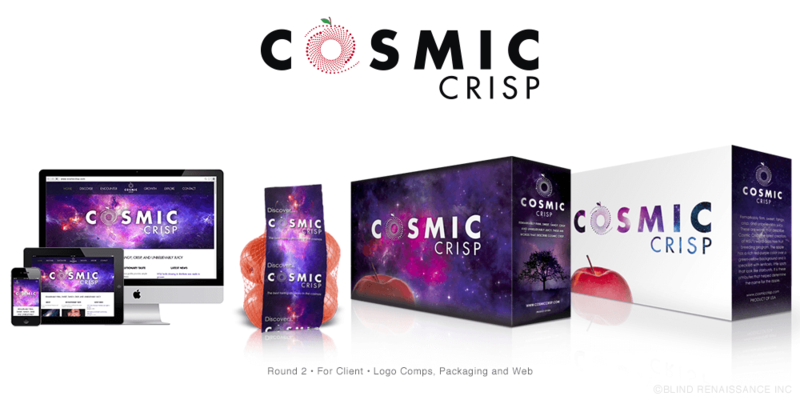 The name Cosmic Crisp was the most popular name choice among focus group surveys conducted by Washington State University. The "dots" you see on the apple above have the appearance of stars in space. Hence the name Cosmic Crisp. 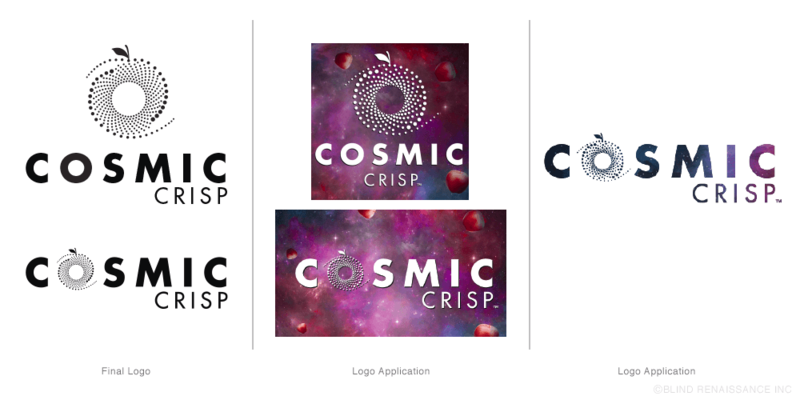 Playing off the Cosmic theme, round 1 logo type was created using different fonts and layout that reflects the look of the galaxy while maintaining an apple identity. Several round 1 logo comps are applied to packaging to decide on the best placement, colors, and logo that makes the product easily identifiable and visually attractive. Narrowing down to 2 logos, comps are applied to packaging and web design to decide which one has the best placement, colors, and logo that makes the product easily identifiable and visually attractive. Final logo applied to galaxy image that will be used for packaging purposes. Final logo application on different packaging options. Final logo application on different packaging options and floor display. 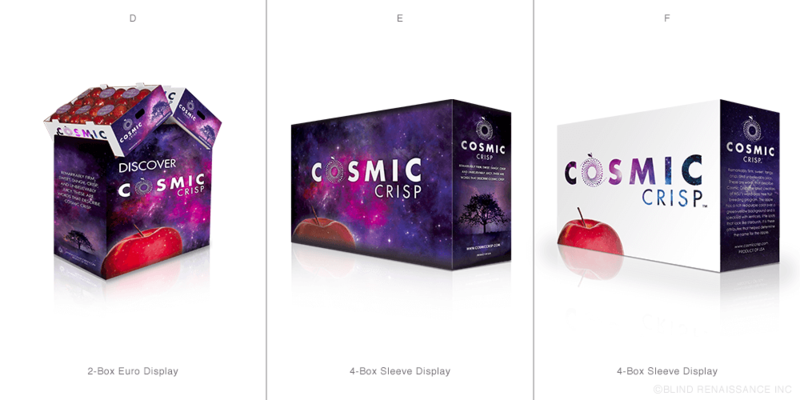 Cosmic Crisp™ brand apples are a cross between 'Enterprise' and 'Honeycrisp'. Cosmic Crisp apple variety is the latest edition of Washington State University's world-class tree fruit breeding program. The large, juicy apple has a remarkably firm and crisp texture. Its exceptional flavor profile provides ample sweetness and tartness, making it an excellent eating apple. In addition to being delicious, it is slow to brown when cut and maintains its texture and flavor in storage for more than a year. Naming the apple involved several meetings with focus groups around the state with sessions in Pullman, Yakima and Seattle. The "Cosmic" factor in the name was developed because of the striking lenticels on the apple surface. Those little spots look like starbursts to some and consumers are believed to be drawn to names relating to outer space and the cosmos. One of the outstanding attributes of the variety is its crisp texture. “Crisp” also links to its parent, 'Honeycrisp'. Playing off the name Cosmic, the logo and imagery were cleverly created with the galaxy in mind. 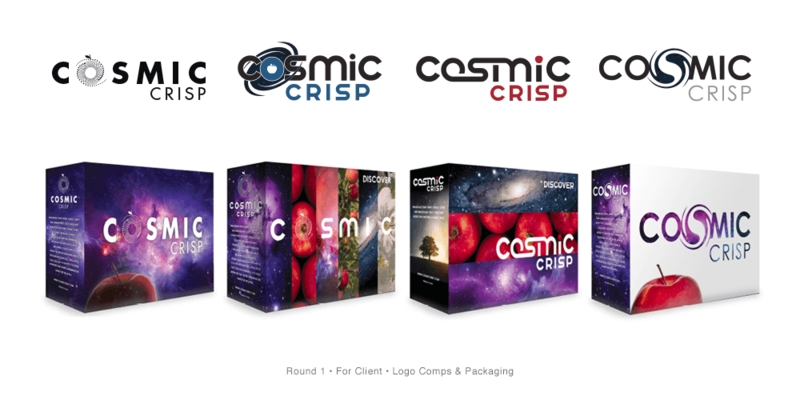 The prominent starry-like lenticels of the new apple was the main inspiration to Cosmic Crisp's logo icon. Paired with the Futura typeface, the whole logo reflects that this will be the next apple variety to rival the most popular and successful apple varieties there are today.